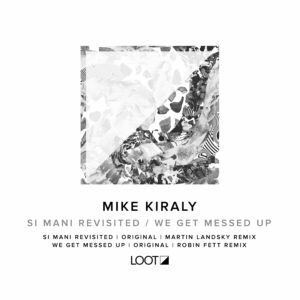 Mike Kiraly returns to Loot Recordings and he is back with a vengeance that comes loaded with remixes from Martin Landsky and Robin Fett. The downright filthy opener ‘Si Mani Revisited‘ is laced up with modular synth effects as twisted sounds swirl on the edge of madness. A big, punchy bass line commands your attention as an androgynous vocal sample plays over and over, further taking the dance floor down the rabbit hole. Esteemed Poker Flat veteran Martin Landsky is on remix duty and heads straight for the club with his signature style of tough rhythms. He teases and tweaks the vocal sample to create tension throughout the track, cleverly adding builds and breaks to increase the energy in all the right places. Kiraly’s next original is the superbly freaky ‘We Get Messed Up‘. With undulating drums, unhinged vocals repeating over and over and dark synths, it is a mesmerizing tune that dials up the energy like a slow boil. A monstrous rolling bass line underpins the whole thing and it’s peppered with crazy effects that will send the crowd wild. Last but not least, label associate Robin Fett again operates in the woozy region between house and techno with a deep, tasteful interpretation. His atmospheric track is stripped back, but filled with future soul as the newly treated main vocal becomes a hypnotic hook above silky drums.